Dabo Swinney says MLK wouldn’t have sat out the anthem. Really? It’s absurd for Clemson football coach Dabo Swinney to invoke Martin Luther King Jr. to scold the NFL’s anthem protesters. Clemson University football head coach Dabo Swinney and Denver Broncos linebacker Brandon Marshall. Photo illustration by Slate. Photos by Jennifer Stewart/Getty Images, Ron Chenoy/USA Today Sports/Reuters. There’s more good than bad in this world. I think one of the greatest leaders this world has ever seen was Martin Luther King. I don’t know that there’s ever been a better man or better leader. To me, he changed the world. He changed the world through love in the face of hate. He changed the world through peace in the face of violence. He changed the world through education in the face of ignorance. And he changed the world through Jesus. Boy, that’s politically incorrect. That’s what he did. It’s amazing when we don’t learn from our past how you can repeat your mistakes. Those fellow clergymen—a group of eight white Alabamans—had written an open letter to King accusing him of using “extreme measures” in his protests of segregation, measures that would lead to “hatred and violence.”* Among King’s methods: marches, boycotts of local businesses, and sit-ins at Birmingham lunch counters. The Clemson coach indeed prefers the absence of tension—you don’t want to be a distraction to your team—and gets the vapors when confronted with direct action. If he looked a bit more closely, Swinney might see that the values he claims to believe in, the ones embodied by King, are present in the players protesting the anthem. 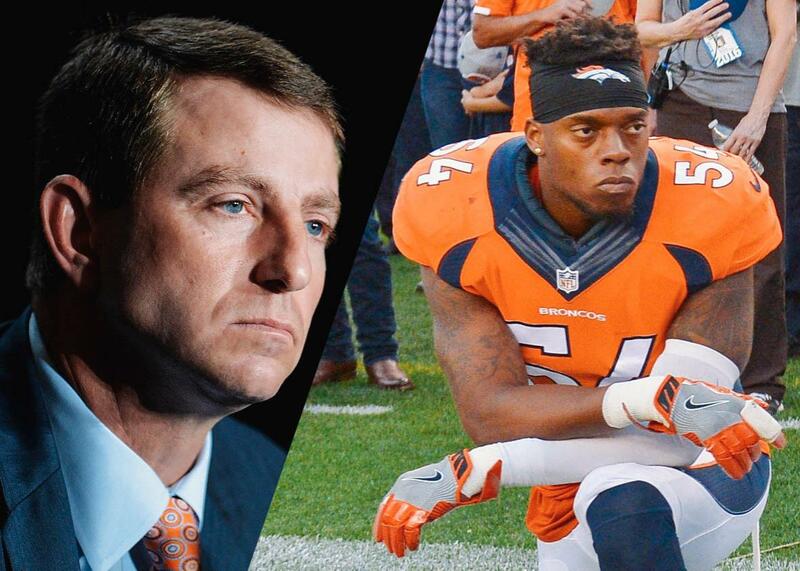 Consider the case of Denver Broncos linebacker Brandon Marshall. Swinney says what Martin Luther King Jr. did was right and what Brandon Marshall and his cohort are doing is wrong. Let’s go through Swinney’s description of MLK and see where Marshall might have lost his way. This summer, Marshall said he was dining with friends at a restaurant within Miami’s Bayside Marketplace, an enclave of restaurants and stores near downtown. Diners heard gunshots outside and ducked under tables out of fear. Police entered the restaurant minutes later and asked patrons to leave. “I start walking to the exit I know,” Marshall says. “And there’s a lady in street clothes telling me to go a certain way, but I went my way. She starts yelling, Stop him! I’m walking and the police come, and I turn around and about five of them rush me. They grab me and they’re trying to wrestle me and take me to the ground. I’m standing my ground because I didn’t do anything; not fighting, but not laying down. Swinney ended his praise of King by declaring, “It’s amazing when we don’t learn from our past how you can repeat your mistakes.” That’s by far the smartest thing the Clemson football coach said. In a speech at Oberlin College in 1965, King explained why “We Shall Overcome” had become the soundtrack of the civil rights struggle. Later in that same speech, King said, “Let us stand up. Let us be a concerned generation. Let us remain awake through a great revolution. And we will speed up that great day when the American Dream will be a reality.” Dabo Swinney—the white moderate, more devoted to order than justice—isn’t just snoozing through the revolution. He’s telling the concerned generation they shouldn’t be so concerned. There are games to be played, you know. Football season is the least convenient season of all.